The Democrats objection to President Trump’s tax plan is that it is ‘tax cuts for the rich.’ That is always their objection to any sort of tax break for Americans. 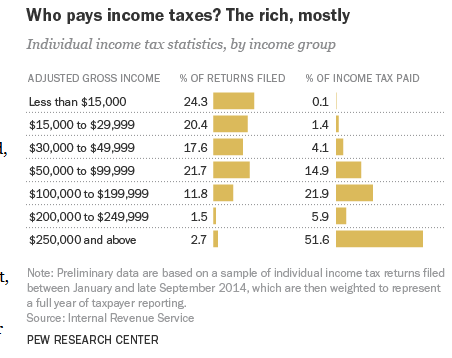 Never mind that the rich pay most of the taxes, Democrats do not want to give them a break. Obviously it does not make a lot of sense to cut taxes for people making less than $50,000 a year–they don’t pay a lot of income taxes to begin with. 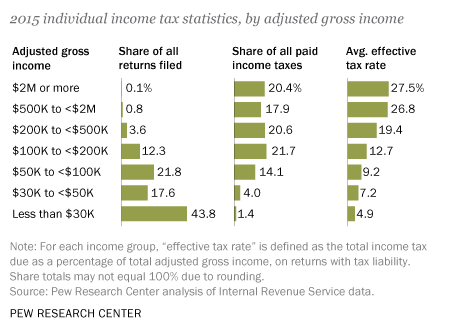 Before we turn to the question of “the rich,” let’s first understand the implications of higher income tax revenues after income tax rates were cut during the Reagan administration. That should have put an end to the talk about how lower tax rates reduce government revenues and therefore tax cuts need to be “paid for” or else there will be rising deficits. There were in fact rising deficits in the 1980s, but that was due to spending that outran even the rising tax revenues. As a source more congenial to some, a front-page story in The New York Times on July 9, 2006 — during the Bush 43 administration — reported, “An unexpectedly steep rise in tax revenues from corporations and the wealthy is driving down the projected budget deficit this year.” Expectations, of course, are in the eye of the beholder. The problem is not the revenue–it’s the spending. Unfortunately, Congress has not yet heard the cries of the American people to stop overspending. It may take another election to cause them to listen.